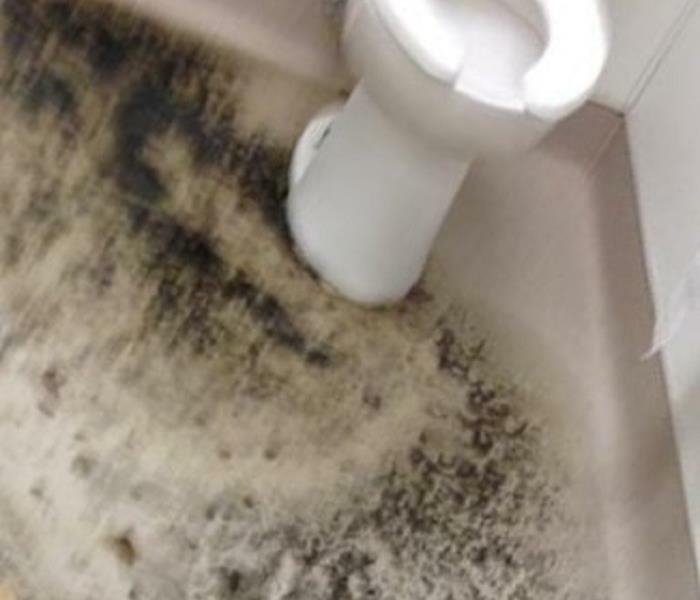 Water damage left unaddressed can result in microbial (mold) growth. Mold can present serious health issues if not addressed promptly and correctly. This home had mold growth behind their fireplace. Call SERVPRO of Metrocrest to help with all your mold remediation needs. 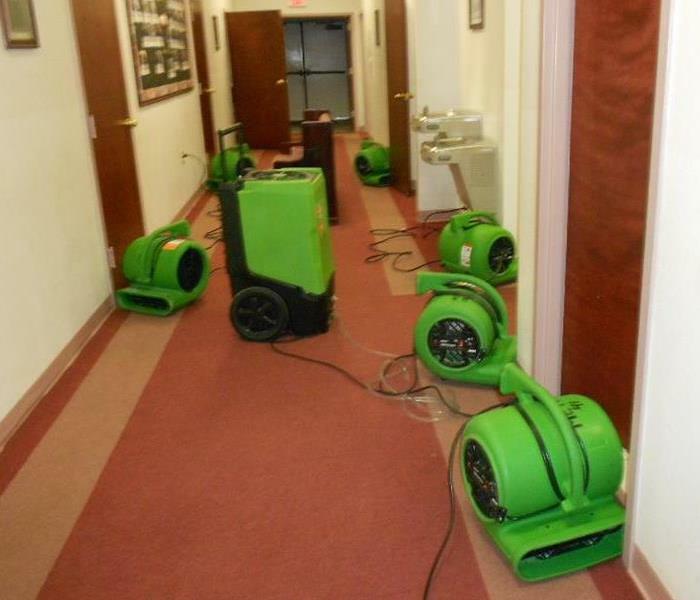 When your office or commercial building experiences a water damage emergency, you need the team at SERVPRO of Metrocrest. 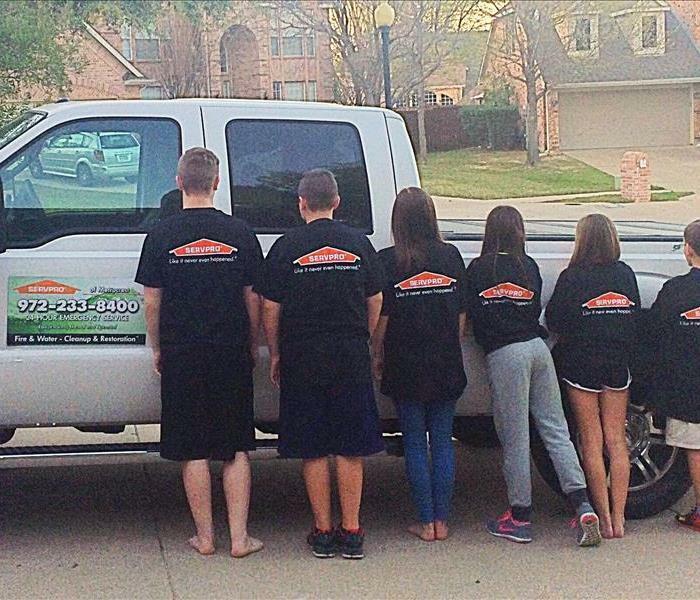 SERVPRO is locally owned and operated, and we are available 24/7. Our team is the best in the industry! SERVPRO of Metrocrest is Faster to Any Size Disaster! 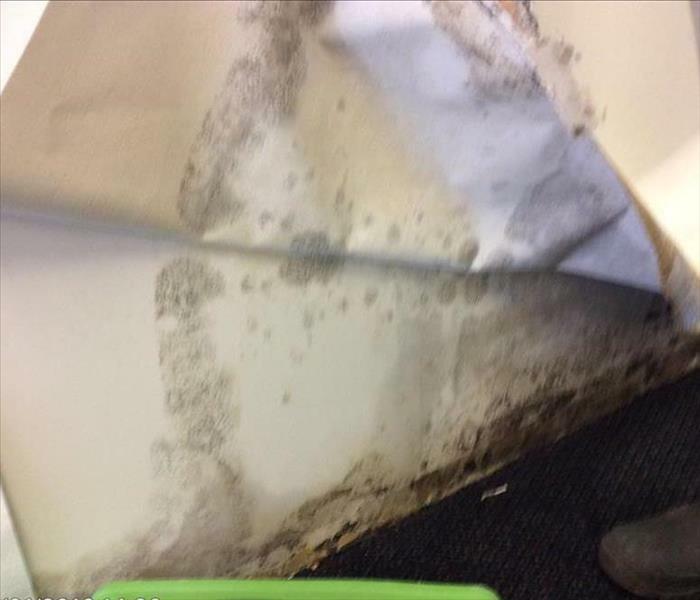 A preschool experienced mold in their bathroom from a pipe leaking in the wall. Their facilities manager called SERVPRO of Metrocrest (972) 233-8400 and our certified technicians came out and conducted our mold remediation process. No job is too big for SERVPRO of Metrocrest. The toilet supply line was the cause of this water damage at Arlington, TX church. Our technicians work after hours to accommodate the church’s schedule. SERVPRO of Metrocrest understands the stress and worry that comes with water damage and the disruption it causes to a home or business. We are dedicated to making it "Like it never even happened." 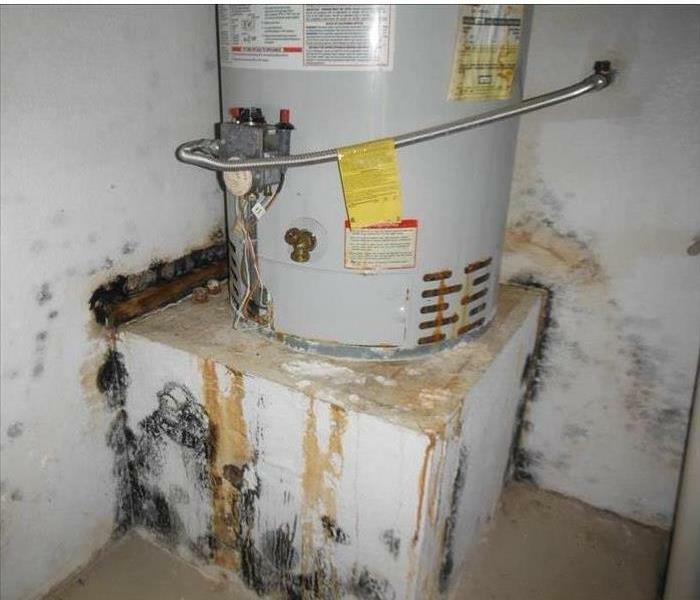 One of the more common mold damages we see is on the water heater, either because they are in a separate storage closet or because people store stuff around the heater. Check your water heater regularly for leaks to prevent mold damage like this. For your mold remediation, call SERVPRO of Metrocrest (972) 233-8400. A water heater leaked in this 2 story Farmers Branch, TX home causing damage throughout the house. This photo shows the water leaking through the ceiling the garage. Call SERVPRO of Metrocrest (972) 233-8400 for your water mitigation and structural drying needs. When you see or suspect mold in your Dallas, TX home or business, save the mold cleaning for the professionals. We perform mold remediation nearly everyday and can take care of your property and get you back up and running with no mold in no time. Call SERVPRO of Metrocrest if you have any mold concerns (972) 233-8400. Water damages can happen at any time anywhere. As you can see in the picture above, this medical office has patient files in a room where a water damage occurred. The medical office acted fast and called SERVPRO of Metrocrest. We got there ASAP and helped save not only their carpet and walls but also their medical/patient files. 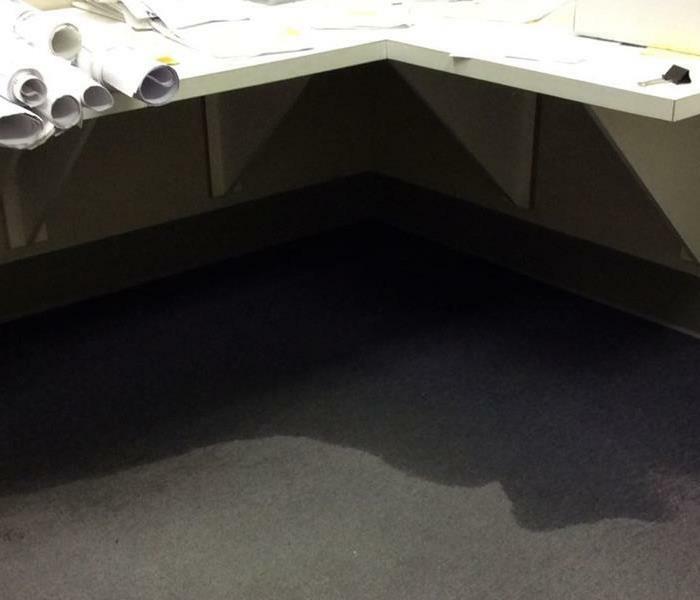 A recent heavy rain storm in the Dallas, TX area caused this commercial building to get a roof leak. SERVPRO of Metrocrest was there to help and we made sure to get their business back up and running ASAP! 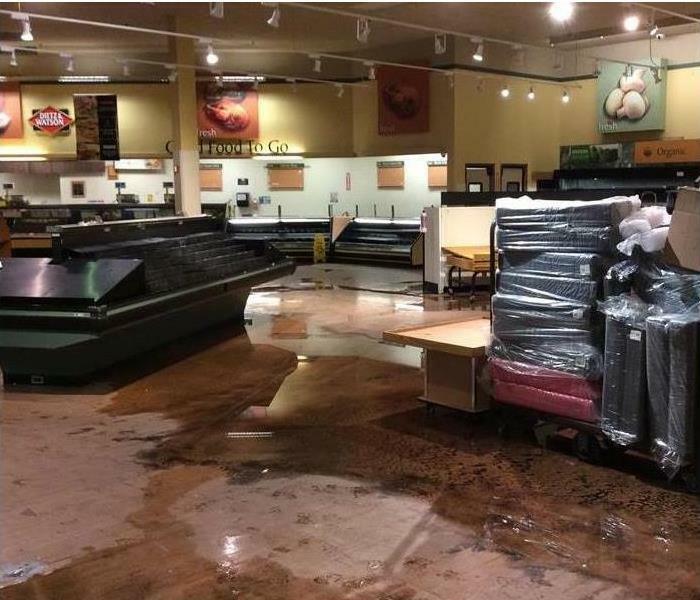 This empty grocery store in Dallas, TX suffered from the recent rain storms when it flooded. SERVPRO of Metrocrest was able to get out to the store shortly after the water damage occurred. We were able to extract all of the water before it caused any real damage. We were glad to be able to arrive promptly, act fast and clean up the water in a timely manner to prevent any saturation and further damage from occurring. This apartment was affected by smoke and soot from an apartment fire a few units away. 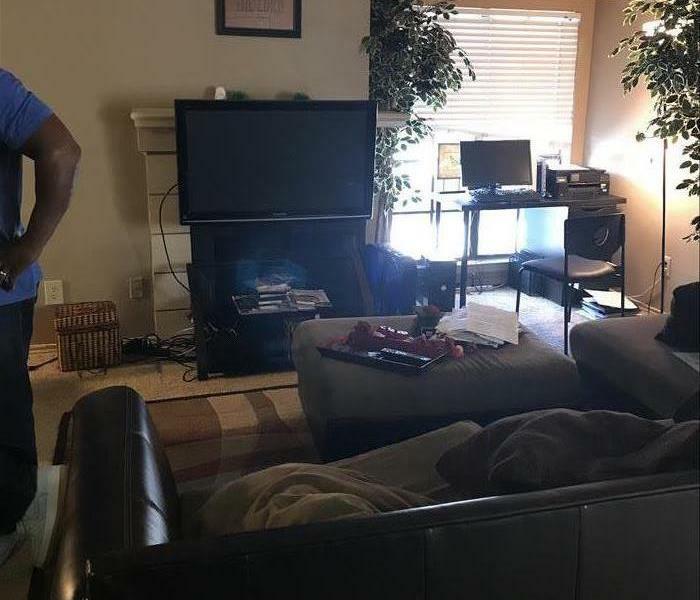 SERVPRO of Metrocrest was called by the renter to come in and clean and deodorize their apartment. A water damage can happen at any time including on an early Sunday morning before a church service. 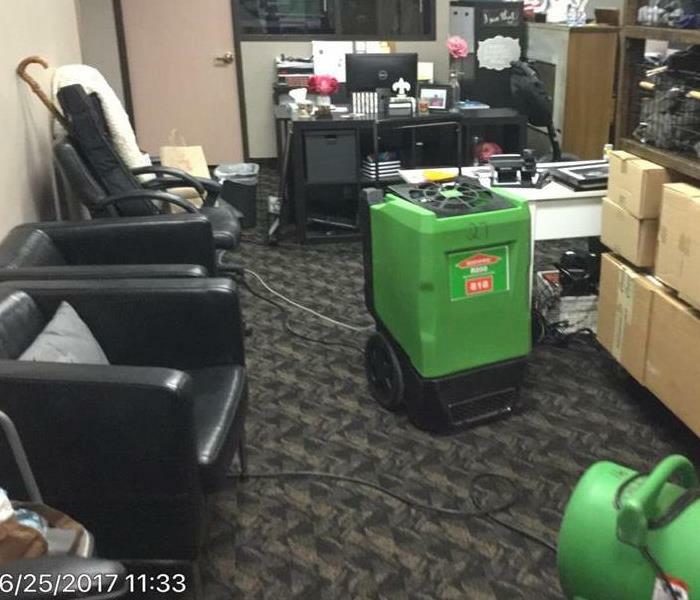 As you can see in this picture, the office at a church in Carrollton, TX had water that seeped in from outside and soaked their carpet. They thought fast and called SERVPRO of Metrocrest to assist with their water damage. Our team was able to extract the water and set up our drying equipment before their first service began. Heavy, wind driven rain caused extensive flooding of this manufacturing building in Dallas, TX. About 7,500 sq ft of the building was flooded. SERVPRO of Metrocrest was on-site in less than 1 hour of being called of the loss. The customer was very happy to see us. A shower with a pipe leak behind the wall of the shower caused mold to develop in a master bedroom. The picture shows that the moisture had moved underneath the hardwood floors, as well, causing damage to the floors. 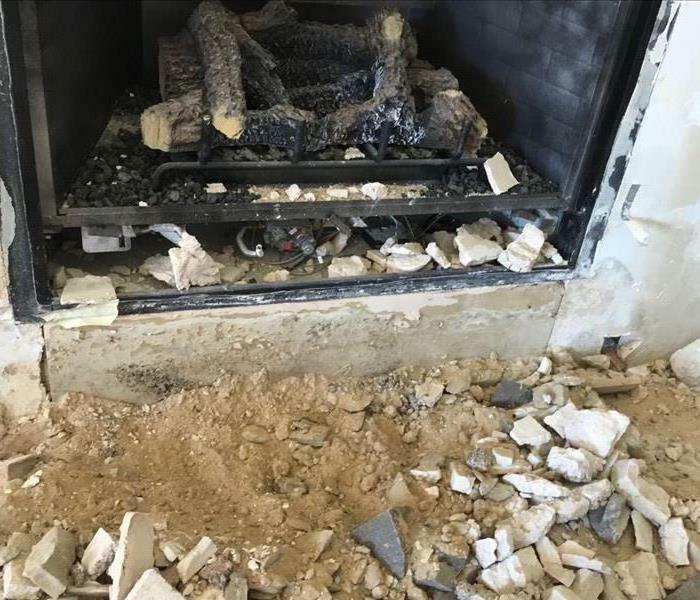 A cast iron pan being used on a ceramic stove in Coppell, TX caught the stove on fire by burning through the ceramic material. Cast iron pans are not recommended for use on ceramic stoves. The result can be burned cabinets and walls. These are the smoke and soot affected walls and ceilings of an Irving, TX home's detached game room after a recent electrical fire. SERVPRO of Metrocrest was able to save all affected contents, and salvage a majority of affected structure. 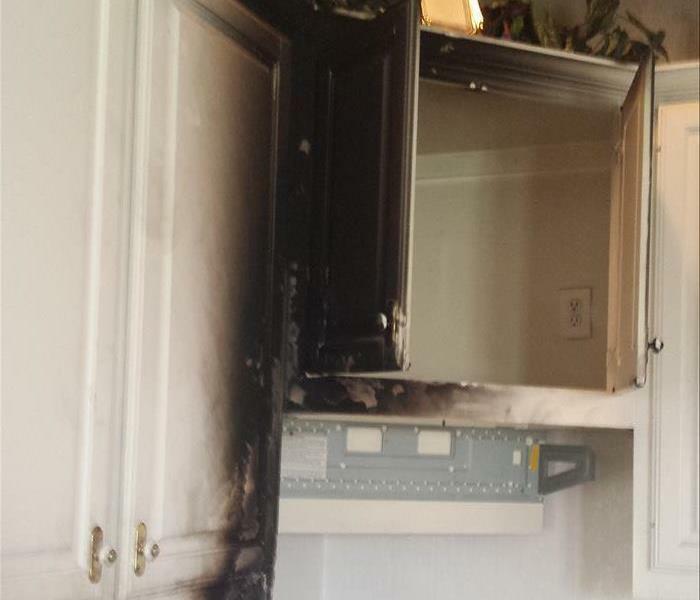 A stove fire in a Dallas, TX kitchen was caused by burning chicken that was left alone and caught the kitchen vent hood and cabinets on fire. This allowed smoke and soot to move throughout the home. 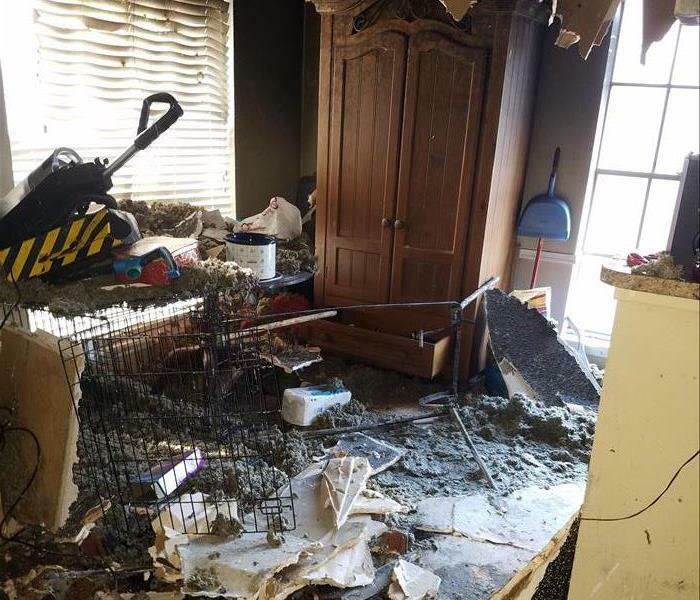 A fire that began from a grill on a balcony in Coppell, a Dallas TX suburb, caused this apartment unit to be badly damaged from fire and smoke. SERVPRO of Metrocrest was called out to remove all contents and structure that could not be salvaged. SERVPRO of Metrocrest was called out to a water damage with 3 floors affected at a 14 story building in Plano, TX that was just being finished. The water leak was caused by a HVAC bleed line. SERVPRO of Metrocrest was on-site within 30 minutes of receiving the call. Mold damage was found on a wall of an apartment damaged by fire. The fire department sprayed the unit down to put the fire out. 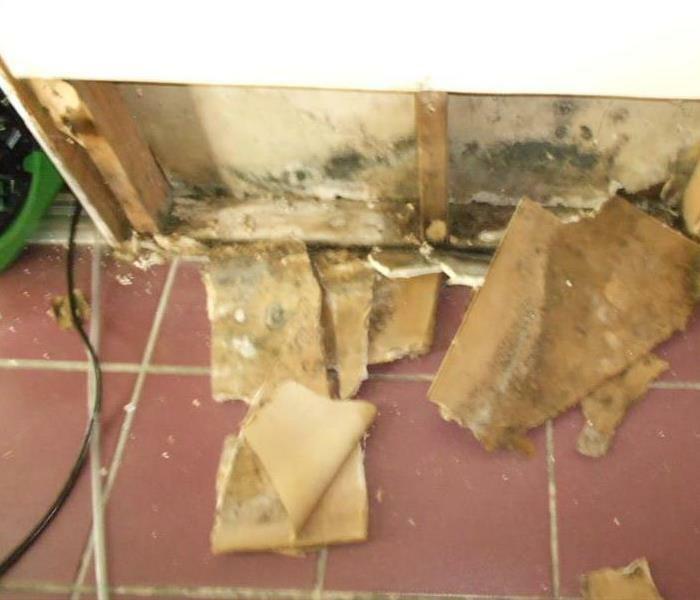 The moisture caused mold to develop, because the structure was not dried out. SERVPRO of Metrocrest was called out for fire and smoke damage cleanup and discovered mold growth as well. Mold development can be seen on this bank's wall in Carrollton, TX that SERVPRO of Metrocrest was called out to for water damage cleanup. The water had been slowly leaking over many months from the HVAC system prior to the water heater busting. This flooding was the result of damaging winds and rain that allowed water damage to this Farmers Branch warehouse. 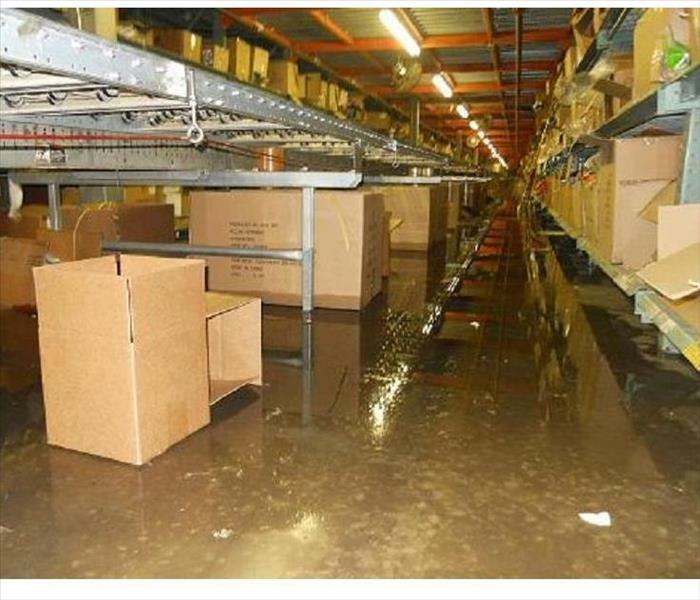 The water was over 5 inches deep in some areas of this 200,000 sq ft facility. SERVPRO of Metrocrest was called out to perform all water extraction and contents drying. A restaurant in Plano, TX had flooding inside their building from rising waters. SERVPRO of Metrocrest immediately dispatched a 3 team crew to the flooded restaurant to extract all the unwanted water. 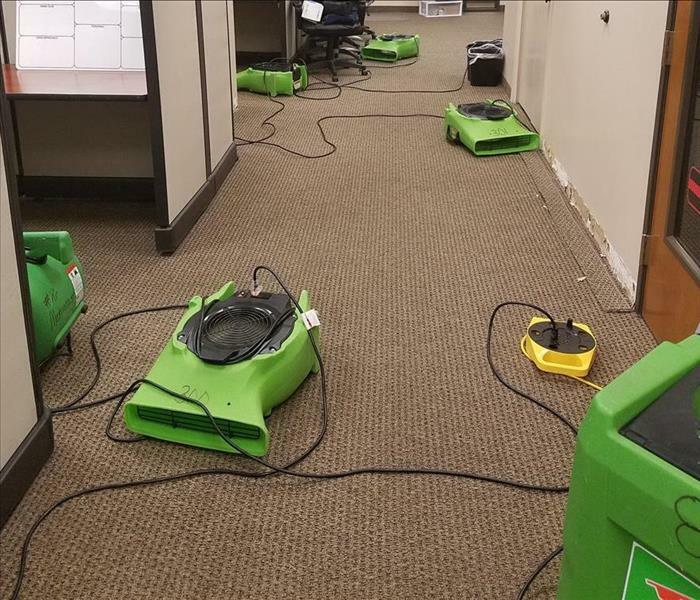 SERVPRO of Metrocrest was then able to dry all the floors and walls affected by the waters with our commercial drying and dehumidification equipment. 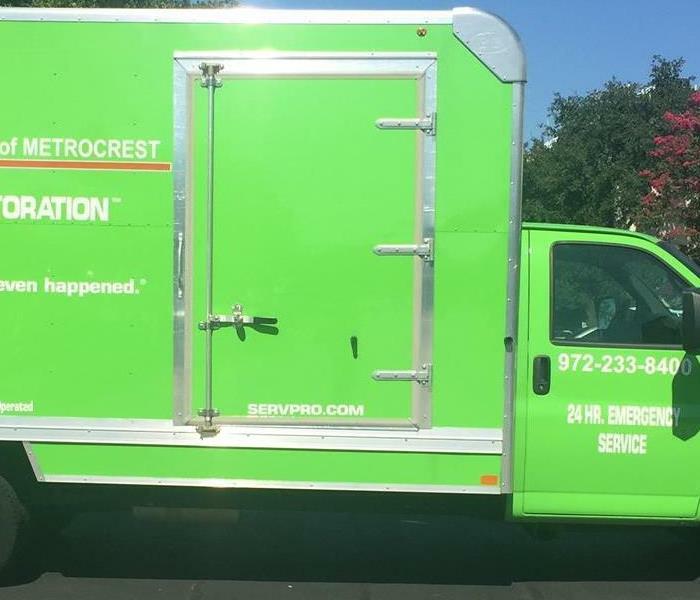 A SERVPRO of Metrocrest truck mounted production van performs water extraction in McKinney, TX. Over 2,000 sq ft of flooded carpet was extracted on this job after a water damage occurred at the home. Water extraction is one of the first steps in any water damage remediation. Water extraction and drying on a commercial water damage that occurred due to a toilet running all weekend. SERVPRO of Metrocrest arrived on the loss site and quickly decontaminated and mitigated the water damage. The property manager was very pleased with the efficiency and professionalism that the SERVPRO of Metrocrest team displayed. 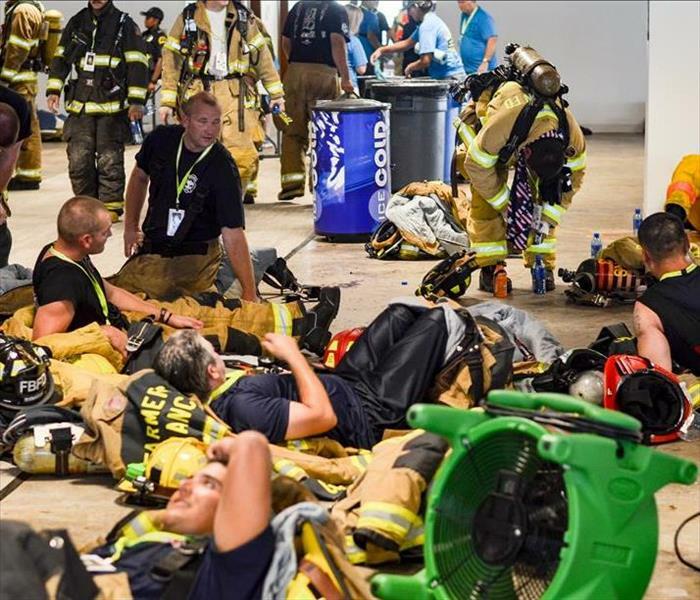 SERVPRO of Metrocrest donated lots of fans to the Dallas 9/11 Memorial Stair Climb to cool off overheated fire fighters, EMS, and other amazing volunteers that participated in this grueling charity event. After the volunteers climbed the 110 floors of stairs in full gear, they were greeted by lots of water and our cooling fans. A sewage water backup occurred at a large bank in Carrollton, TX that affected over 7,000 sq ft of the 16,000 sq ft building. SERVPRO of Metrocrest responded after being notified by the property manager, and was on-site beginning cleanup within 20 minutes of the call. SERVPRO of Metrocrest is ready for any size disaster. Sprinkler head busted on a municipal basketball court, so SERVPRO Of Metrocrest concentrated dehumidification on the wood floors to dry out and ensure the salvaging of the court. 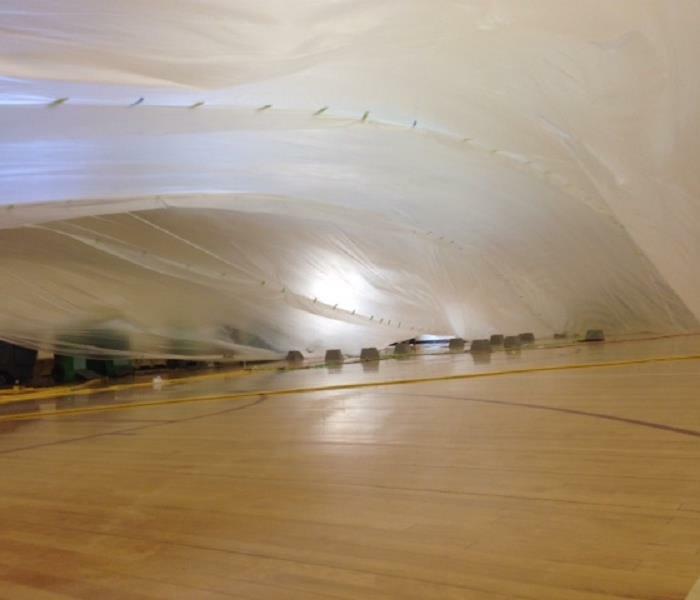 Affected areas of the floor were tented with plastic to pull moisture from floor efficiently before cupping began. 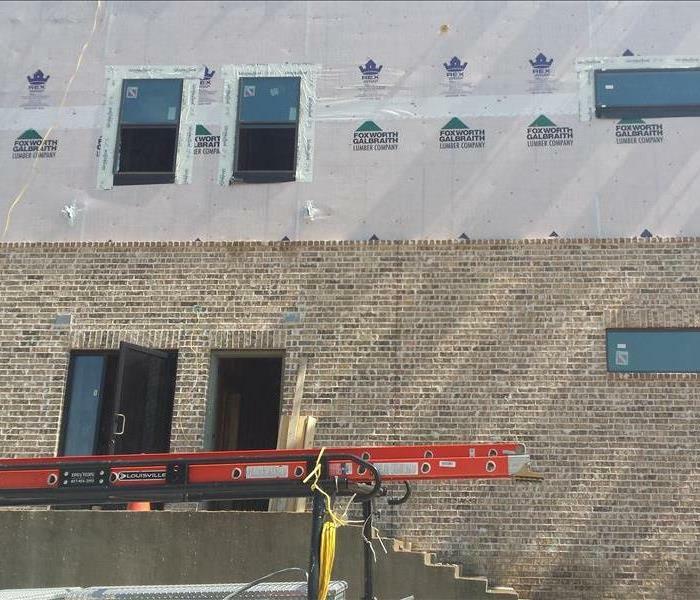 SERVPRO Of Metrocrest was called to dry out an apartment building in Denton that was under construction. The building was over 100,000 sq ft with about 60,000 sq ft affected with water damage from a busted pipe. SERVPRO dried the building out with a large desiccant, over 100 LGR's and 500 air movers. SERVPRO Of Metrocrest was on-site in 45 minutes to a large pre school in North Dallas to get the school ready for classes by 9 am. We were able to extract all standing water and situate drying equipment in a way that allowed classes to continue uninterrupted. This facility was flooded when winds tore a hole in the roof. SERVPRO of Metrocrest was on site in 30 minutes to extract over 16,000 sq ft of water from the affected fields for an upcoming tournament over the coming weekend. 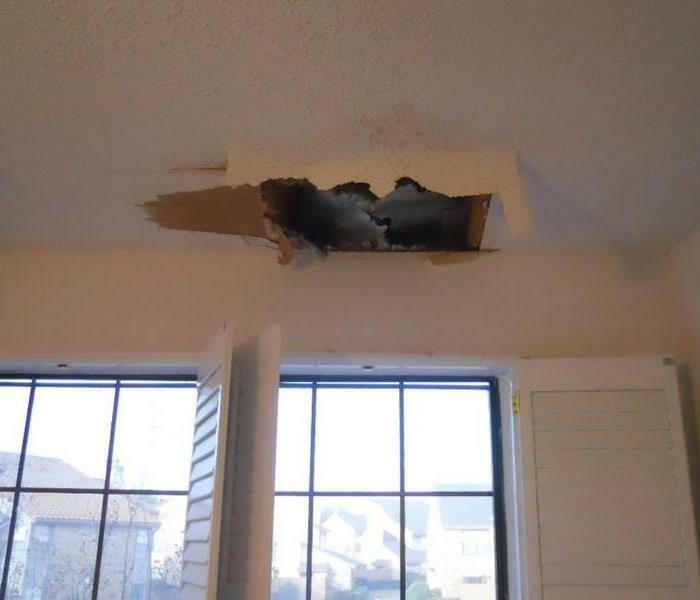 A water heater in Frisco, TX busted in attic causing water to damage wood floors in the room below. 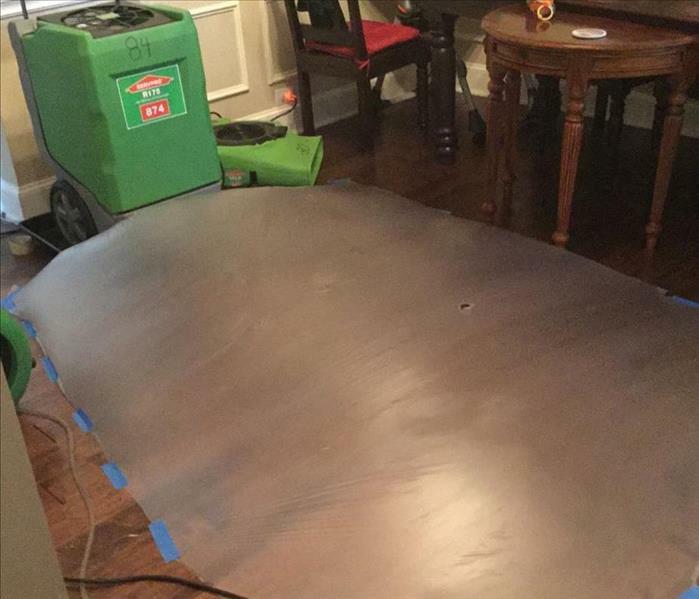 SERVPRO of Metrocrest used plastic to encapsulate the affected wood floors, and then used a dehumidifier to blow hot, dry air into the area. The temperature of the blowing air was 95 degrees with a humidity of 11 percent. We were able to save the affected flooring. 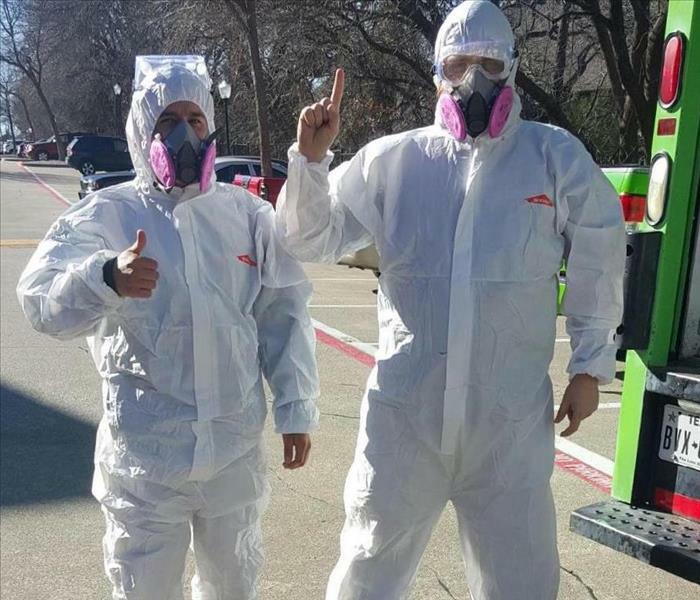 2 of our biohazard technicians at SERVPRO of Metrocrest, James and Javier, ready to start a cleanup in McKinney, TX. READY to GO! The SERVPRO of Metrocrest family collected canned foods at Glen Oaks Elementary School in McKinney, TX in January 2016 for donation to Metrocrest Social Services. Thanks to the generosity of the parents and students at Glen Oaks Elementary, SERVPRO collected over 200 cans of food that were taken in for those in great need. 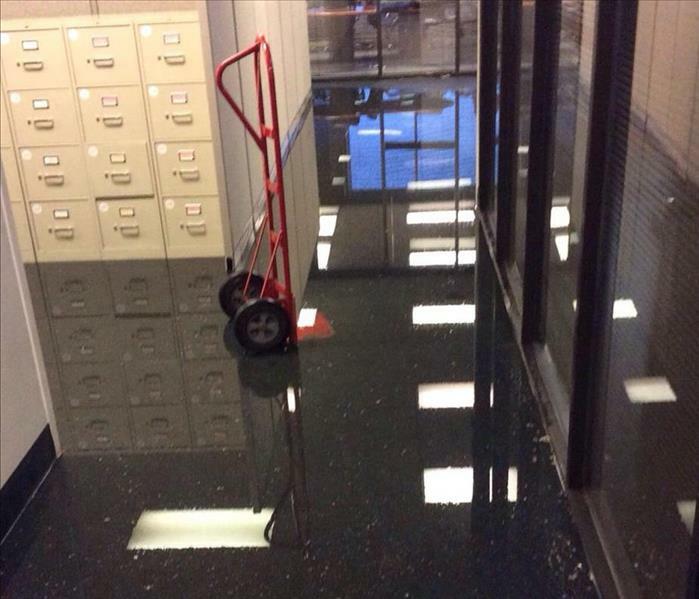 SERVPRO of Metrocrest was called at 9:48 pm to a flooded office building in Plano, TX. The second floor water heater had busted and continued to run continuously to the first floor of the business. Over 6,000 sq ft of glue down carpet and tile floors were wet from the water damage. SERVPRO of Metrocrest arrived on-site by 10:45 pm and extracted all standing water while moving office furniture and other miscellaneous contents. After extraction, SERVPRO of Metrocrest setup 10 LGR dehumidifiers and over 60 air movers to dry out the affected walls, ceiling, and floors. SERVPRO of Metrocrest is ALWAYS ready when disaster strikes, whether it's a residential or commercial structure.